Today I have a few things from Jamberry Nails to show you: strengthening base coat, ultra shine top coat, some nail polish, and some lovely nail wraps. Being a girl with very little patience, I usually do not use a base coat when I paint my nails (fast forward 3 days and I'm mad at myself as I stare at my stained nails). Not only do base coats help prevent staining, but they also give your nail an extra layer of protection to prevent breaking (CURSE YOU, CORNER BREAKS!). I tend to be somewhat of a total klutz, and I bang my nails on literally everything you could imagine. Last week I broke a nail opening a bottle of nail polish. Only me. Well, when you're sent a base coat to review on your blog, you sort of HAVE to use it, LOL! I am so glad I have it - not only is it very easy to apply, but it dries very quickly, too... which is perfect for all my fellow impatient Pattys out there. =P I am happy to report that yesterday I NEARLY lost it when I caught my nails on the edge of a contain I was trying to open - until I looked down and saw that there were still intact! YAY STRENGTHENING BASE COAT! I was also sent an Ultra Shine Top Coat. If you know me, you know I LOVE shine - and this top coat gets the job done very well! This is NOT a fast-dry top coat, so you'd be better off using it when you want to stick studs/rhinestones etc. to your nail (fast-dry topcoats are no good for this, because they dry before you have a chance to apply your rhinestones!). Application was very, very, easy, and the formula was fantastic. I liked the flat brush, too. Isn't it perfect for Valentine's Day?! Let me know what you think in the comments! This is so freaking cute, I can't even handle it. Love the colors and the accent nail but, you got my hopes up, It is only Thursday!!! OOPS!!! haha I just fixed it!!! Darn, I was hoping that meant I didn't have to work tomorrow!! 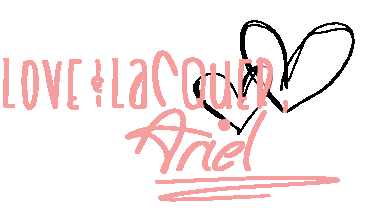 So cute - I love it! These are so cute! I've actually never heard of Jamberry but they look promising. LMFAO - just what I need - even MORE time to do my nails haha! 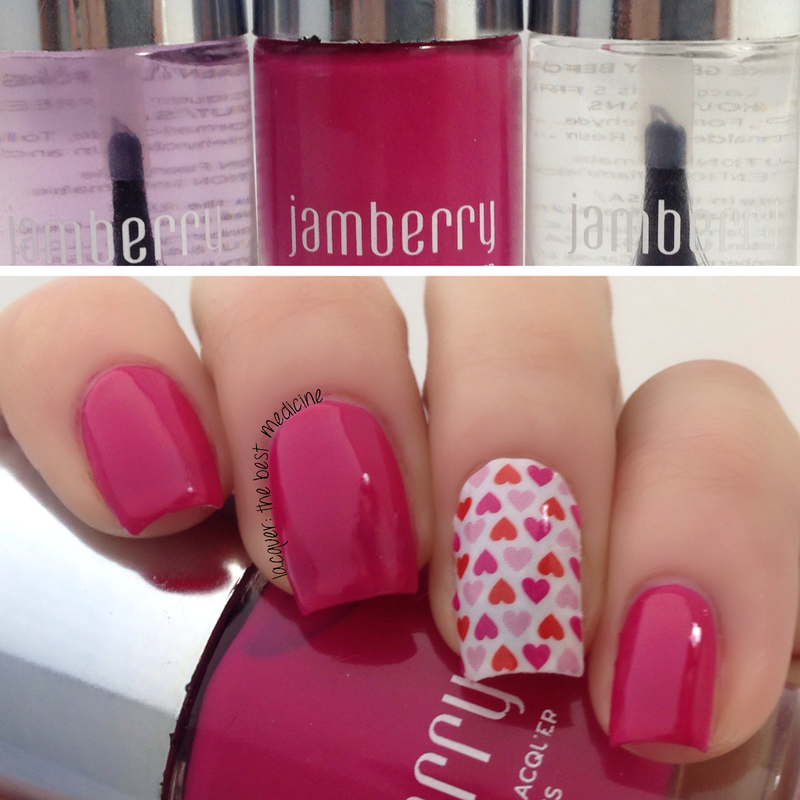 Jamberry products are really cute, but in my opinion they're a bit pricey! Seen products that are just as good or better at half the price. Just my opinion! They are beautiful though, I will say that. 100% agree! They are definitely pricey. But the polishes really are beautiful! I can actually get up to 4 applications with just one sheet of Jamberry. If you cut down the bigger pieces and use them for the smaller nails you get more bang for your buck. Pricey? I was actually impressed with the price as it averages to be less than $4 per mani/pedi. What can I say? I'm in love with their wraps now. I wasn't really interested in the lacquer, though, until I saw your beautiful manicure!! Now I must try!! Love Jamberry wraps! I'm the kinda girl that loves nail art and would sit down for an hour or more making sure I had everything right, but these are soooo much better. I put them on fast and easy, and can go about my way in a fraction of the time. If any of these ladies have any questions, I'd be happy to help answer them! The really positive thing about the Jamberry Nail Polishes is they don't contain all the harsh chemicals that other nail polishes contain like Formaldehyde. It is much better quality and doesn't take multiple coats. The Nail Wraps (again, does not contain harsh chemicals) last for 2 weeks, each sheet contains enough nail wraps for 2-3 manicures and at $15.00 a sheet, this averages out to $5.00 a manicure. Since I have been using the nail wraps my nails are stronger and healthier than they have been in years. Any more questions, I would be happy to answer. www.debiholley.jamberrynails.net Just 1 more thing...selling them is so much fun that it hardly seems like work! Ask me how you can be a part of a great company and have hands like a rock star!!! I love my Jamberry Nails! And as far as lacquers go, they have one that can turn your regular polish into a matte finish...super trendy and fun! 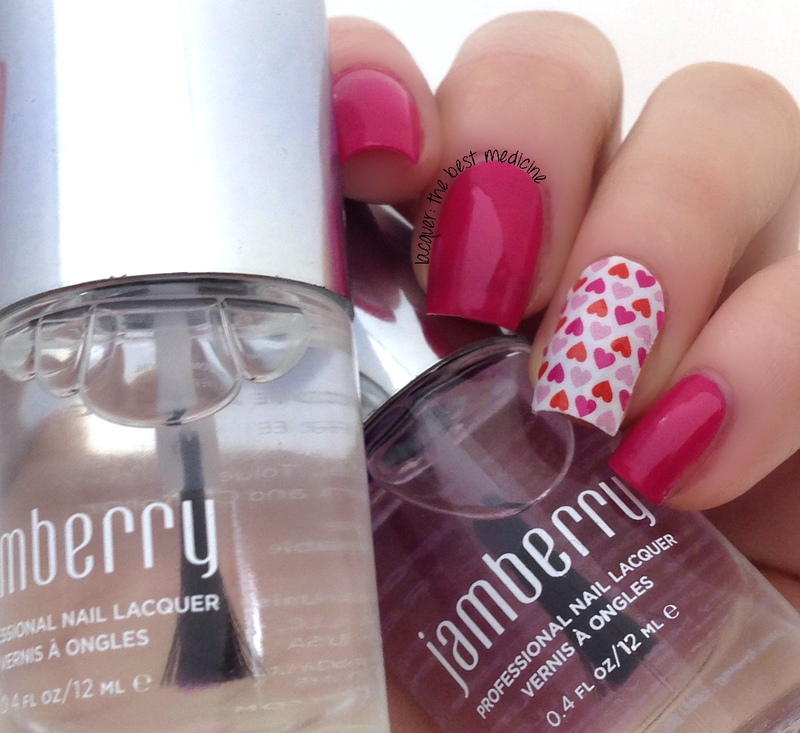 I must also brag about the manicure kit and cuticle oil from Jamberry. Excellent product quality and value compared to what you get at the drug store. My nails are stronger and longer than ever and I am convinced it is from the cuticle oil! Do the lacquers last as long as the wraps do (or at least longer than your average store polish)? And would using the Jamberry base and top coats with another brand of polish still give the longer lasting effects? I like to do my own nail art, so I'm not that interested in the wraps, but I would definitely invest in the base and top lacquers if it would help my mani last longer... spending an hour or so on detail work on my nails only to have my hard work start chipping off 2-3 days later is REALLY frustrating! Wow! So pretty! I didn't start caring about polishing my nails until late January of this year, and it was only because I wanted them to look nice for Senior Dinner Dance. I got tips put on, and have been getting them filled in every few weeks since then. Jamberry sounds like it will be a MUCH better investment, and they last just as long! :) I've been paying $17 for a fill-in and re-polish every few weeks, but Jamberry's only $15 for THREE SETS! What?! This is awesome. Really excited to try out my first set.